Tiger Woods' long trail of triumphant moments includes several in Northern California - stirring comeback in the 2000 AT&T at Pebble Beach, historic romp in the U.S. Open later that year, memorable playoff victory over John Daly at Harding Park in '05. Woods' appearance in next month's Presidents Cup offers another chance to burnish the NorCal chapter of his career. But his history in our little corner of the world stretches deeper. 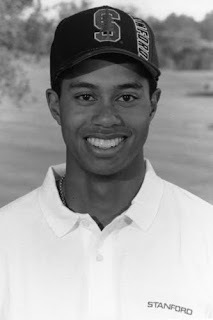 Remember, he lived in the Bay Area for two years as a student at Stanford in the mid-1990s - two years that shaped Woods in ways beyond propelling him to fame and wealth as the world's best golfer. He already was a much-hyped phenom, with three U.S. Junior Amateur wins and one U.S. Amateur title, when he arrived as an 18-year-old freshman in the fall of 1994. 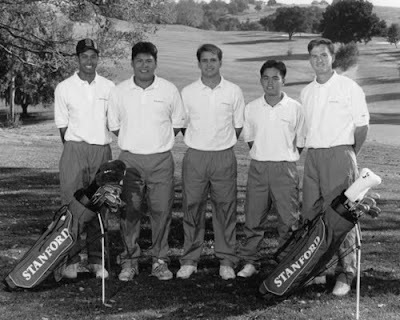 But to the seniors on Stanford's golf team - who had won the NCAA championship in the spring and were standout players in their own right - Woods was a scrawny target. Notah Begay III considered it his duty to treat Woods like any other freshman. This meant he carried the bags on road trips (at least initially) and found himself in the worst seat on the van and airplane and worst room in the team hotel. Begay chuckled as he reflected on those distant days, given Woods now travels in a private jet, owns a luxury yacht and could buy an entire hotel if he wanted. "We felt like we were entitled to give Tiger a hard time," Begay recalled last week. "Now he's having the last laugh." Woods lived in coed freshman dorms and realized he was in a different realm when one roommate took apart his computer and put it back together, just for kicks. Current Stanford coach Conrad Ray, a college teammate of Woods', said Woods enjoys telling that story, much as Ray likes telling the one about a Woods roommate who was hardly awed by Tiger's burgeoning stature in golf circles. He took a call one day from a guy named Greg with an Australian accent, then forgot to pass along the message. As Woods was leaving for the Masters in April 1995, the roommate remembered - and Woods realized it was Greg Norman, one of the world's top players, calling to arrange a practice round at Augusta National. Amusing memories aside, Woods offered an uncommonly animated answer when asked how his two years at Stanford shaped him. "I look at those as two of the greatest years I've ever had - being away from home for the first time and learning how to cope with things, how to learn, how to grow," he said. "We were all in the same boat together trying to get through it together. "I'll never forget the intelligence people had and their perspectives on so many different subjects, the things I was exposed to. It certainly did shape me, no doubt about it." Read the full article at: http://www.sfgate.com/cgi-bin/article.cgi?f=/c/a/2009/09/19/SP4N19O6OI.DTL. Photos from Stanford photo archive.